Power tools can be extremely dangerous, especially those that are used for concrete saw cutting. Power saws, in particular, need to be handled with care and respect, because the blade can cause a lot of damage. Safety is a primary issue to consider before picking up any type of power saw. There are multiple options when it comes to sawing concrete, from entry-level flat work to wall saws, wire saws, handheld cut-off saws, and traditional chainsaws. Typical cut out saws use a disc blade, but there are also those with ring saw blades, abrasive blades, diamond blades, and custom chainsaw blades. The majority of saws have electric motors, although some have gas engines and even hydraulic alternatives. It is important that you are aware of the type of engines available to determine the safety procedure to follow. The most obvious danger when cutting concrete is the saw blade. If used incorrectly or in a sloppy manner, operators might cut themselves, or worse still sever a finger or limb. It might sound far-fetched, but it happens. Kickback and locking in are also issues to be aware of. Another major risk is the effect of silica dust that is often generated when cutting concrete. For saws, the most crucial safety issues include ensuring guards are maintained and positioned correctly, and blades kept straight and tight. It is also essential that the correct blade is used for every task. They are much more effective than abrasive blades. They are less costly than most alternative options. But there is still considerable choice amongst diamond blades, and they must be used correctly. If not used for the correct application the blade could break. Furthermore, it is important to check that the blade is not damaged beforehand as damaged blades break more easily during cutting. A damaged blade may overheat and this could result in cracking that damages the blade, and often the work piece being cut as well. One way to check the condition of the saw blade is to knock the blade with a wooden club. If the blade makes a ringing sound, chances are the blade is damaged. In any case, it is advisable to check saw blades regularly to ensure they are always in prime condition. Correct mounting of the saw blade may seem to be a simple task, but it can be quite complex and is crucial for safety. The first step when mounting any blade is to turn off the power and ensure the cord is unplugged. This may seem obvious, but it does lead to accidents. Once the power is off, use the correct tools to tighten the arbor. This will ensure that the blade is correctly placed and won’t wobble when the saw is turned on. When using a new blade it is important that it is able to spin at maximum speed without coming apart. Viewed slightly differently by various saw manufacturers, “kickback” refers to the point where the saw pulls back toward the user. “Locking in” refers to the point where the blade becomes jammed in concrete and pulls the saw from the user. Both of these issues can be detrimental to the operation, but both can be avoided through correct safety procedures. Kickback can be caused when the upper section of the cutting blade is obstructed. To avoid this from happening, keep the saw’s blade spinning at maximum speed before cutting. Locking in is a similar issue to kickback and can result from the blade being pinched or shifted by a moving work piece. If possible, clamp the work piece to stop this from happening. Another cause might be cutting of a radius too quickly or too deeply. You can avoid this by making a shallow guide before cutting more deeply into the concrete with high-speed diamond blades. If you are cutting concrete with a diamond or abrasive blade, it is very likely that the blade will generate silica dust, which can be a serious health hazard. Because it is very fine, silica dust is easily inhaled and can result in a serious lung condition known as lung fibrosis. According to the National Institute for Occupational Safety and Health, approximately 300 construction workers die every year from lung fibrosis caused by silica dust inhalation. This is why the Institute has implemented a permissible exposure limit (PEL) for airborne silica dust crystals. The PEL determines how much silica dust a worker can be exposed to during a single shift. A good rule of thumb is that if the dust can be seen, chances are it exceeds the allowable PEL limit. The measures used to prevent exposure to silica dust are known as “engineering controls” and they need to be implemented for adequate safety measures in a company. The PEL is highly significant because it indicates the measures business owners and operators need to take to avoid too much silica dust being airborne. Anyone who can’t avoid an area where silica dust is present should use a respirator – including anyone working with concrete saws. At the end of the day, safety issue that seem obvious to one person may be less apparent to another. All saws are packaged with a list of power tool safety rules. These range from unplugging electric tools before changing blades to using the tool for its noted application rather than another task. Follow them! Regardless of specific issues, it is essential that employers and workers maintain a secure environment. To ensure that the health of non-construction device operators is maintained, it is recommended that these individuals remain a minimum of 50 m from any concrete cutting operations. It is also advised that all workers wear the correct protective equipment and take personal measures to avoid any risks associated for concrete cutters. This includes safety goggles to reduce the risks of dust associated with workers’ eyes. It is essential that these glasses are comfortable because workers will be wearing them for prolonged periods of time. If you thought diamonds were a girl’s best friend, you might be right, but they are also the best choice when cutting concrete. When it comes to making clean, professional cuts in concrete, diamond saw blades are regarded as a perfect option. There are, though, a number of different options in terms of type and price. It is important to understand how diamond blades work so you can choose a blade with the right cutting quality and characteristics for your needs. First of all, diamond blades aren’t actually saw blades made with diamonds (as in gems). Rather, they are blades that are made using synthetic diamond crystals that cut absolutely anything – including concrete. The rate of wear of the blade is controlled by the hardness of the matrix. Diamond blades are used with power-driven tools, depending on the material to be cut. As the blade rotates at high speed, the abrasive action of the exposed crystals slices through the material. With continued use, the surface diamonds become worn and the matrix starts to shed, exposing sharp, new diamond crystals embedded within the matrix. Diamond saw blades come in many different sizes and configurations to meet the varied requirements of users. These relate to the thickness of the blade and segment width. To ensure maximum blade life and cutting speed, it is important to match the blade as closely as possible to the material being cut. The blade you use for cutting reinforced concrete will not necessarily be the same as the type used for cutting asphalt, or even concrete slabs, even though most diamond blades cut through different type of materials. • A diamond blade for cutting relatively soft, abrasive, green uncured concrete needs a hard metal bond to ensure that exposed diamonds are utilized fully before shedding. • Blades used to cut hard, nonabrasive concrete need to have a soft bond that allows for easier erosion of the matrix, ensuring exposure of sharp, new diamonds when needed. According to blade manufacturers, a soft concrete material is one with a compressive strength of 3000 psi, and a hard concrete material is one with a compressive strength higher than 6000 psi. So a blade with a hard bond should be used for cutting lower-strength concrete, and a blade with a soft bond for high-psi concrete. Hard aggregate like quartz and basalt tend to dull diamond particles quite quickly, so you should use a blade with a softer bond. Blade performance is also affected by the size of the coarse aggregate in the concrete. When cutting through larger aggregate (¾ inches or more), the blade will tend to cut and wear more slowly. Pea gravel (less than 3/8 inches) is easier to cut, but blades will wear more quickly. The abrasiveness of concrete depends on the type of sand used in the mix, with round sand producing the least abrasiveness, and sharp, gritty sand the most. Sand sharpness is largely determined by its origin. Natural river sand is typically round and nonabrasive, while crusher sand from quarries is typically sharp. The more the abrasive the sand, the harder the bond requirements will be. Assuming you plan to cut control joints in the concrete, you can cut it one or two hours after placing it, while it is still green. Alternatively, you can wait until it has begun to harden overnight. The type of blade chosen will depend on the timing of the cut. 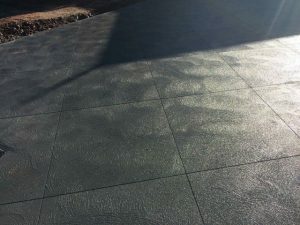 Decorative concrete contractors often prefer cutting concrete when it is still green as it minimizes random cracking and allows for a shallower joint depth of one inch or less. However, green concrete is softer and more abrasive than concrete that has cured. This is because the mixture has not yet bonded to the mortar. Manufacturers of blades typically offer hard-bonded diamond blades specifically for cutting green concrete. The other choice is between cutting concrete dry or wet. This will depend on your job requirements and preference. Dry cutting excludes the need to work with wet slurry and equip saws with hoses and water tanks, while using a wet blade reduces dust. A dry cutting blade and compatible saw may be the only option when working indoors where work areas must be kept dry. The weld is the key difference between dry and wet blades. Dry-cutting blades have segment welds that are heat resistant and do not need water for cooling. They are typically intended for intermittent cutting and for use on low-horsepower, handheld saws. If you want to saw decorative patterns in concrete, dry-cutting blades will create clean, crisp cuts. Just remember that decorative cuts are usually 1/16 and ¼ inches deep and they don’t function as control joints. Walk-behind saws use wet-cutting blades for making cuts in concrete that has cured, bearing in mind it takes 28 days to cure and reach its compressive strength. The benefit is that water-cooling allows for deeper cuts. While you can use many dry-cutting blades in wet conditions, you must never use wet-cutting blades without water. Cool the blade using water consistently to avoid blade warpage and segment loss. Manufacturers usually provide charts with recommended operating speeds for their blades. You will find this information stamped on the blade too. Whether you are using a flat or handheld saw, always match the blade with the saw’s speed range. Operating the blade at a lower speed than recommended can reduce its performance and cutting life. Operating it at a higher speed can damage the blade and increase the risk of injury for the saw operator. 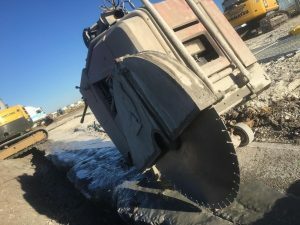 Most of the blades used for cutting green concrete are designed for use with special early-entry saws to minimize joint ravelling and even spalling. Avoid using blades that exceed the maximum blade diameter and the saw’s depth capacity. The cost and quality of diamond blades varies from basic economy level to professional, top-of-the-line premium types. The main difference is the diamond content, which is the greatest raw material cost in manufacturing these blades. It might cost you 20 per cent more to move up from a standard to premium blade, but the blade will have a higher diamond concentration and significantly longer life. You need to decide what is most important to you: the total sawing cost or the initial cost of the blade. For small cutting jobs you can potentially save money if you choose the economy blade. For frequent use or large jobs, a top-quality blade could be cheaper in the long run based on a breakdown of cost per cut. Premium grade diamond blades aren’t cheap. You can expect to pay several hundred dollars or more depending on the diameter of the blade. If this is too much to spend for occasional cutting jobs, consider hiring a professional to do the work. The Concrete Sawing and Drilling Association (CSDA)’s directory will help you find a contractor in your location. 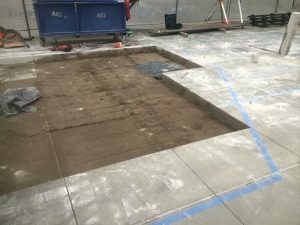 It is a rarity for a concrete cutting service to provide a quote before doing a full inspection of the site. Each job is always different despite some jobs having more similarities than differences. Once a full inspection is done one job will often pose more problems than another. It may require heavier machinery or additional time to complete. Concreting companies usually have concrete cutting machine, but are rarely equipped for concrete drilling If you need concrete and cutting done, get quotes from one company instead of going to two different services for the separate jobs. This involves getting two very different quotes when, if the concrete cutting company is contacted first, only one is needed. For drilling core holes or large cutting jobs look to specialised concrete companies for precise quotes. The quotes you receive will have everything to do with the nature of the work. The professionals that will do the work use several different types of machinery. They may use handheld saws for jobs where motorized wheel cutters are impractical to use. If they must saw concrete on a flat surface, they will make use of heavier equipment. This is because it is safer and faster to use than handheld equipment is. You could rent a concrete cutting saw from a hire shop especially for a small job. However, the work is best left to the professionals because an improperly done job can be dangerous. When you go to choose a concrete cutter make sure they are licensed and insured. The insurance that they have means you will not be liable in the event something goes wrong. It also means that the job will get done right. The cost of a project will vary. You cannot know for certain how much it will be until a professional concrete cutting or concrete coring company visits your home or the job site to inspect it. Get a few quotes and compare them carefully before hiring the cutting team for your project. 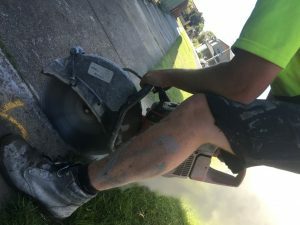 Even though you could do a small job yourself, it is best to leave this type of work in the hands of professional concrete cutters who have experience in this area of work. Decorative concrete requires well-thought out and placed joints to help prevent the concrete from cracking. 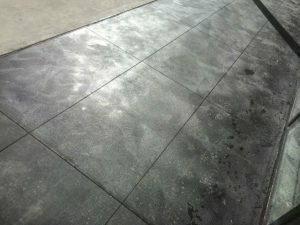 These joints known as isolation cuts are used in all colours of concrete; Continue reading to learn how you can minimize how noticeable the joints are in decorative concrete. 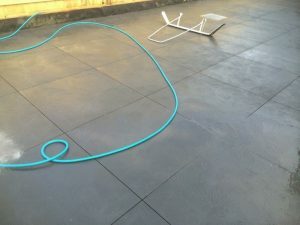 Stamped concrete patterns and engraved concrete still require isolation joints. The joint must be at every 3m intervals of the slab. This means if a pad of concrete is 100mm , then the joints must be 20mm. Stamped patterns and engraved patterns are not deep enough to prevent cracking. 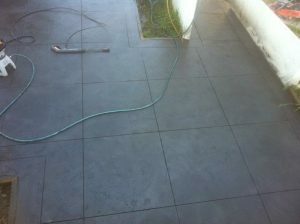 On stamped concrete that has looks like slate or other pattern paving. The pattern can be used to cut in your joints. The joints can vary in order to follow the pattern of the design by as much as 1metre causing cracks. Concreters often use hand crafted to cut expansion joints into concrete. Because shrinkage and expansion do not always run perpendicularly to a joint, a joint following a fieldstone or cobblestone pattern may not function properly. With these patterns, movement can occur in almost any direction, resulting in uncontrolled cracking. If you are putting a slab over the top of concrete , then joints need to match the joints in the bottom slab. A topping slab can experience crackling stress because the base slab is a hard surface. Any cracks in the base should be repaired to help prevent damage to the topping slab.